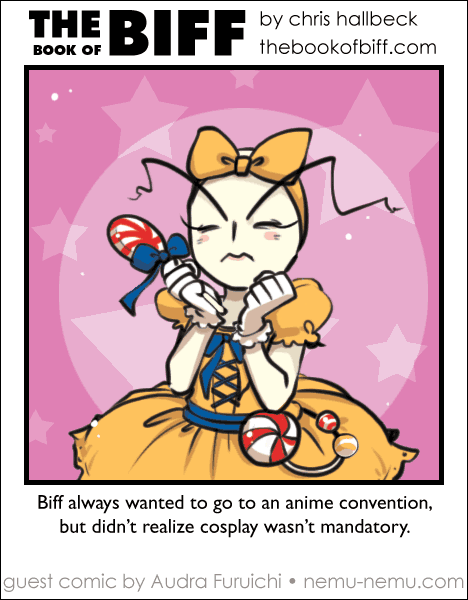 Today’s most adorable drawing of Biff ever is from Audra Furuichi of nemu-nemu! That is the most adorable, cutest Biff ever draw. Period. It’s also the most disturbing. I’m pretty sure someone will cosplay this before too long. Oooh, that’s adorable! And he’s got eyelashes and everything! Pon Pon Pon ft Biff? I think my Kawaii-meter just threw a spring. Well played, Ms. Furuichi. *Very* well played. Yes, Mark me down for the disturbed category. Why does my mind keep trying to make this creepier than it really is?